A 1967 articles tells us that Jack was born in Ottumwa, Iowa, but we've seen other articles mention Bloomfield. Jack later would learn to play the guitar, but it was written that the first instrument he learned was the ukelele that he got as a Christmas gift when he was just four years old. They said the first song he ever sang was "I'm Just A Happy Roving Cowboy". But before we commence with telling you about Jack's career, we can't help but notice how this 1967 article stretches to relate Jack's early experiences with music. We've seen many articles try their own homespun way of telling us how an artist began their musical journey, but Ms. Betty Hofer goes with a bit of a different angle in her 1967 article. SHe notes, "...Jack was exposed to singing as most kids are to chicken-pox. A musical virust struck him at 15, and he never quite recovered!" We think that's the first time we've read where getting interested in music of any sort was likened to catching a virus. We can't fault Ms. Hofer too much for her article does provide a litany of details of Jack's musical journey. Jack tried what we might think were the usual ways of getting heard when first starting out. He would do the local talent shows and would indeed earn recognition or prizes. When the fairs came around, he was a part of the entertainment segment usually as part of the 'local acts' that were usually the opening acts to the more well-known entertainers that came to town. In 1951, and just 16 years old, Jack was doing a live radio show over station KCOG out of Centerville, Iowa. He earned a regular disc jockey stint at that station. That show was only 15-minutes each day. But he persisted. He got his first break early in his career when his state representative of southeast Iowa, John Kyle from Bloomfield, helped Jack make the right connectios to earn a spot on the staff of radio station WNAX in Yankton, South Dakota. It appears that he got this job in 1953, after he graduated from high school in the spring. This appears to have been around March 1954 when Jack was about 18 years old. He began doing appearances in the area with Billy Dean and the WNAX band. Jack told Ms. Hofer that he recalls singing the Webb Pierce hit "It's Been So Long" on the first show he did with Billy Dean. He was making regular appearances on the WNAX Missouri Valley Barn Dance show that would actually travel to various cities within its broadcasting signal. Jack was also appearing over station KVTV in Sioux City, Iowa. In September of 1954, Mrs. Ernest Bjerke was president of Jack's fan club. By 1955, she wrote one Fan Club column that they had over 80 members. In July of 1955, the fan club was to have a big picnic at WNAX in Yankton, South Dakota for all members. In 1955, things really started to look up for Jack. His musical talent led to an opportunity on the ABC-TV show Ozark Jubilee that was hosted by Country Music Hall of Famer, Red Foley. Soon, he was doing personal appearances with such stars as Red Foley, JImmy Gately and Harold Morrison. 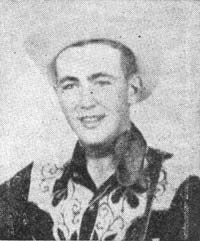 In mid-1955, Balin' Wire Bob Strack wrote that Jack was one of searies of guest disc jockeys on hir "Red River Roundup" show that aired over KWKH in Shreveport, Louisiana. But Uncle Sam tapped him on the shoulder and on April 1, 1961, Jack had enlisted in the United States Armed Forces. That brought his musical career to a temporary halt. He returned to civilian life on February 28, 1964. He met his wife Beverly when he was in the service. She was an army nurse; in fact, a First Lieutenant. His first date with her was actually a bit of a 'dare' from his army friends, who dared him to try and date an officer. Things must have clicked for them for they were married on December 3, 1961. At some point, Jack was a disc jockey at radio station WHOW over in Cliton, Illinois. A little 5,000 watt station in central Illinois, which probably led to a new stint in Peoria. That station was no stranger to country music, having brought country music to its listeners sice 1950. ANother famous alumnus of WHOW was John Hartford. In the late 1960s, he was a program director and disc jockey over radio station WXCL in Peoria, Illinois. At one time, his show was on from 2:00pm to 6:00pm every afternoon. Mary Ann Cooper wrote in late 1968 how Jack got one of his recording contracts. It seems he had done a commercial jingle for a local store in the Music City. The jingle went something like "...big big big deal, big big big deal, it's the biggest deal in this here tow" and apparently listeners found it catchy. One listener, Buddy Killen, decided he wanted to find that voice and have him record on his new Jab record label. The first single he did, "Repeat After Me" garnered quite a bit of attention across the country and eventually it led to his first LP, "Meet Jack Reno". This bit of a break occurred while he was at WXCL. Another hit tune he had in 1968 was "How Sweet It Is". Paul and Ruth Charon mused in their column that year that they thought Jack might get a call to appear on the Jackie Gleasno show. But Jack's tune was released during the summer rerun season. Jackie was noted for his comedic talents and the way he would utter, "How sweet it is..."
You've probably noticed that Jack worked for quite a few radio stations that led to his nickame of "The Ramblin' Reno." But it appears that WXCL provided some stability in his life by the time he got there. Around 1968 or so, Movie Mirror magazine conducted a poll asking fas to vote for their favorite DJ. Jack was the only country DJ on that ballot. In fact, he was named the DJ of the Year in 1968 by the magazine. Another movie type magazine featured Jack in an article, TV Mirror. Jack's recording successes led to the usual string of personal appearances that took him far and wide. In March of 1968, Jim Harris wrote of one of those package shows that were typical of that era. The Shrine Auditorium in the Los Angeles area had a show sponsored by radio stations KFOX and KBBQ. That show included folks such as Roy Acuff and his Smokey Mountain Boys, Minie Pearl, waylon Jennings adn the Waylors, Martie Singleto, Wanda Jackson and the Partytimers, Leon Ashley Henson Cargill and finally, Jack Reno. The backup band was Jimmy Braynt and his ensemble. A 1967 article by Betty HOfer relates a bit of what it was like for radio station WXCL in Peoria, Illiois to grow its audience playing nothing but country music. It reads as a story hard work and determination by the talented staff on the station at the time. The "WXCL Coutry Gentlemen" included not only Jack Reno, but folks such as Jack Barlow, himself a recording artist; Cal Shrum, who was in various Western movies and held the early morning spot on the station. The station seemed to be growing at that time; Ms. Hofer noted that "...advertisers have come to highly respect their efforts." She described Reno as "...one of the most dynamic individuals to ever open a microphone." In 1971, he had perhaps one of his biggest hits, "Hitchin' A Ride" that rode to the umber 12 spot on the national charts and was on the charts for 15 weeks. This author also recalls another tune he did while associated with Dot Records, "We All Go Crazy". Jack Reno passed away in November of 2008 from brain cancer.